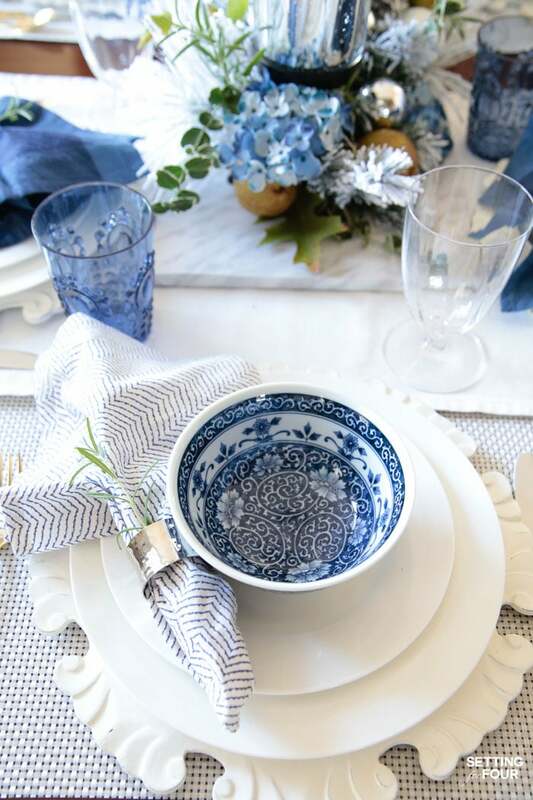 Learn how to create these elegant fall table settings with a blue and white color palette using white dishes, blue and white chinoiserie bowls, navy napkins, sparkly mercury glass and a transitional holiday centerpiece accented with fall herbs, garden greenery and orchard pears. 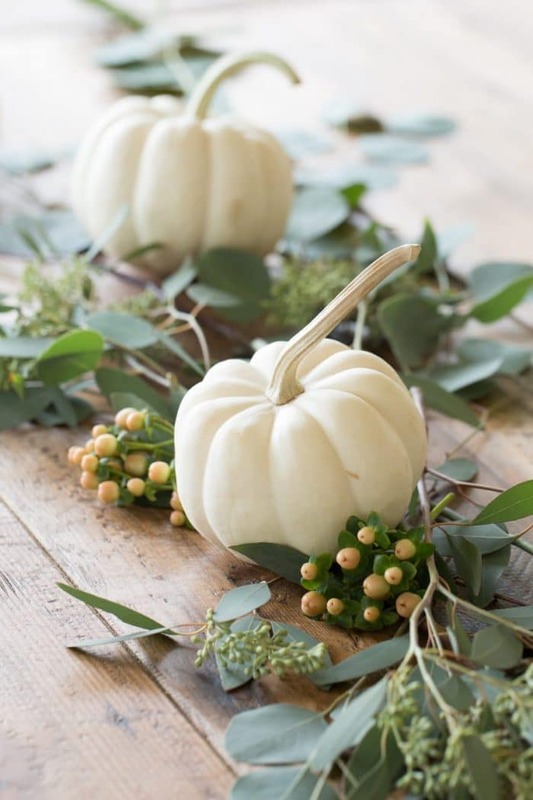 See loads of Fall and Thanksgiving entertaining tips and ideas with this multi blog entertaining tour! Hello friends! I have a big treat for you today! 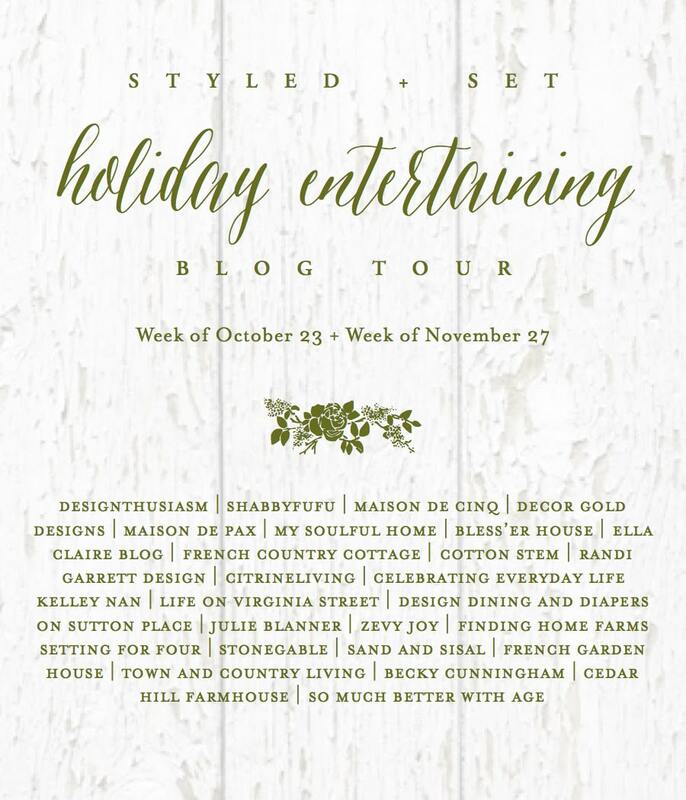 I’m joining 28 of my blogger friends this week to share our late fall and American Thanksgiving entertaining ideas with you in the Thanksgiving edition of Styled + Set the Holiday Entertaining blog tour, hosted by my talented friend Lory from Designthusiasm! If you’re coming from Finding Home Farms – hello and welcome to my home! 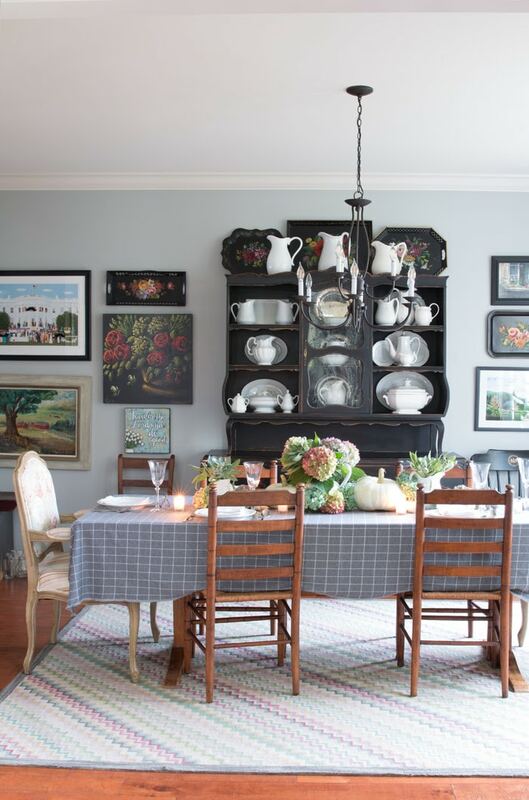 Laura has such a beautiful home and I’m sure you loved her entertaining ideas! The rest of the entertaining tours today are linked up at the end of the post. Today I’m sharing how I created a late fall tablescape using a blue and white color palette paired with fresh fall greenery for a modern take on a traditional autumn look! …and this is the debut of our new dining room chairs! I’m so excited to share them with you today – aren’t they gorgeous? 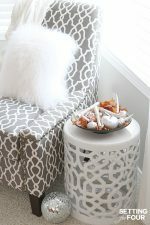 I’m over the moon about them: they are tufted, have nailhead trim and are so comfortable! And they are very affordable! I used this DIY method to make them stain proof and waterproof so they are perfect to use with our boys and entertaining with large groups of people at big dinner parties! So let’s get to the decorating details! The centerpiece I used is the star of the show. 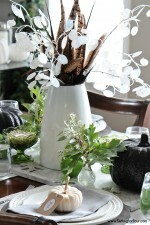 It’s actually a Christmas centerpiece that I transformed into a transitional fall look! I’m so eager to start Christmas decorating this year, I just couldn’t resist decorating with this pretty holiday mercury candle centerpiece! I added one string of mini lights – entertwining it throughout the entire centerpiece. Next I added fresh orchard pears for a fall harvest touch! Then I went into my flower garden and herb garden and I added clippings of fresh rosemary, euonymus and oak leaves from our backyard. I just randomly placed the leaves and clippings here and there, to give the centerpiece a fuller look and add more fall touches to it. Lastly, I added some faux blue hydrangea flowers to the centerpiece for a pop of beautiful blue! I used some gorgeous blue and white chinoiserie bowls I picked up to repeat the blue color story I’m creating. I also used two different styles of napkins to my table – I use this decorating trick to add more interest to my tablescapes. 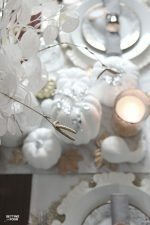 I usually add two different but coordinating colors and patterns to the table end place settings to mix things up a bit! I also placed a fresh rosemary clipping in each silver napkin ring! It makes the dining room smell amazing! In my opinion the Thanksgiving holiday and rosemary just go together like peanut butter and jam! 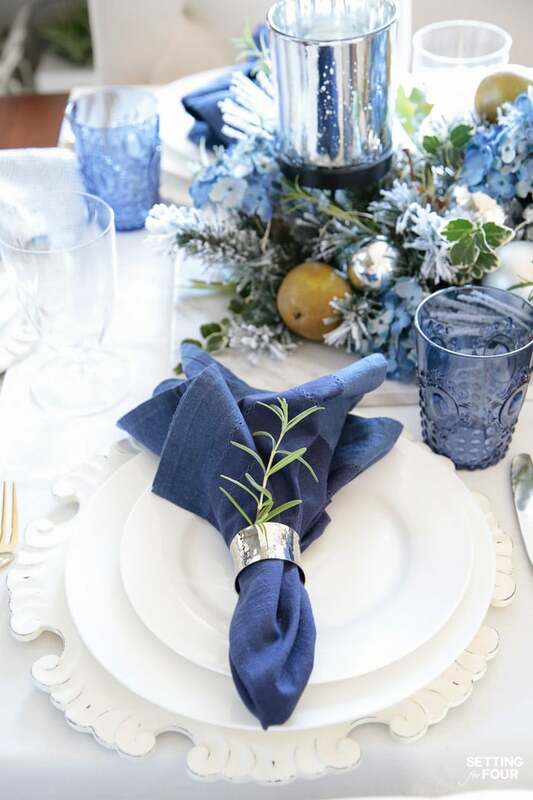 These blue glasses and navy napkins add another layer of pretty blue to the table settings and also repeat the blue in the centerpiece. 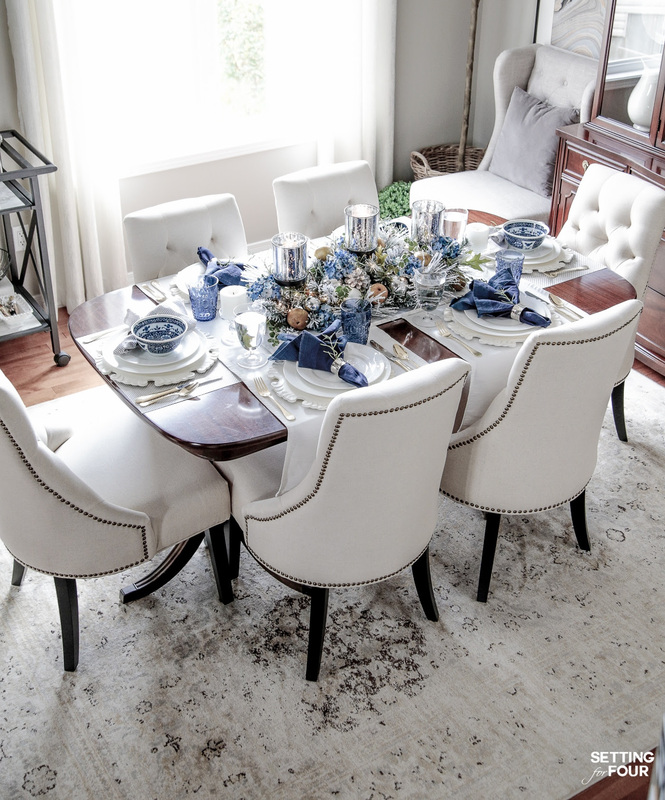 Design tip: Choose an accent color for your tablescape and repeat it at least three times to get that designer look! You don’t have to use the exact shade of accent color but make sure the colors coordinate. Here I chose blue and used it in the centerpiece, glasses and napkins. I used white dishes on white charges – I absolutely love layering white dishware for a clean, modern look! 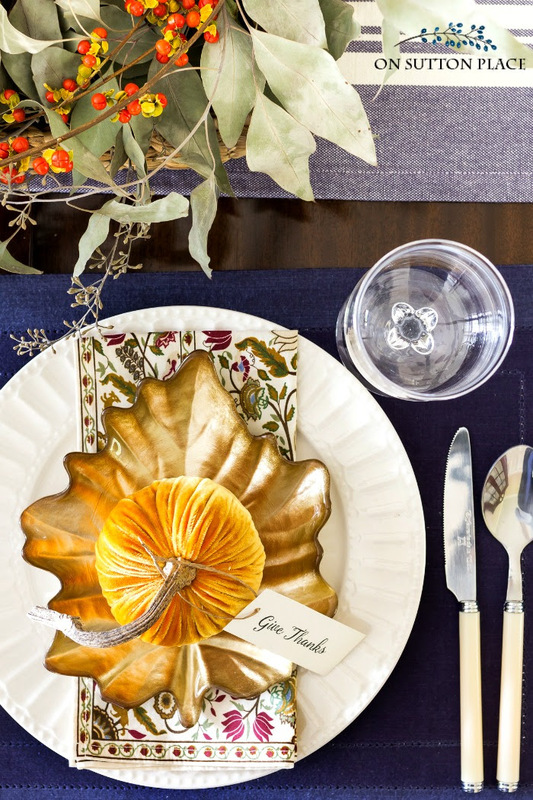 I hope you enjoyed see my Elegant Fall Table Settings With A Blue And White Palette and found some new decorating ideas for your dining space! 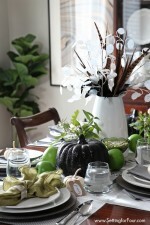 Elegant Fall Table Settings Resources: Click on each image below to see more about each item! Where actual items were no longer available, I’ve provided similar options. 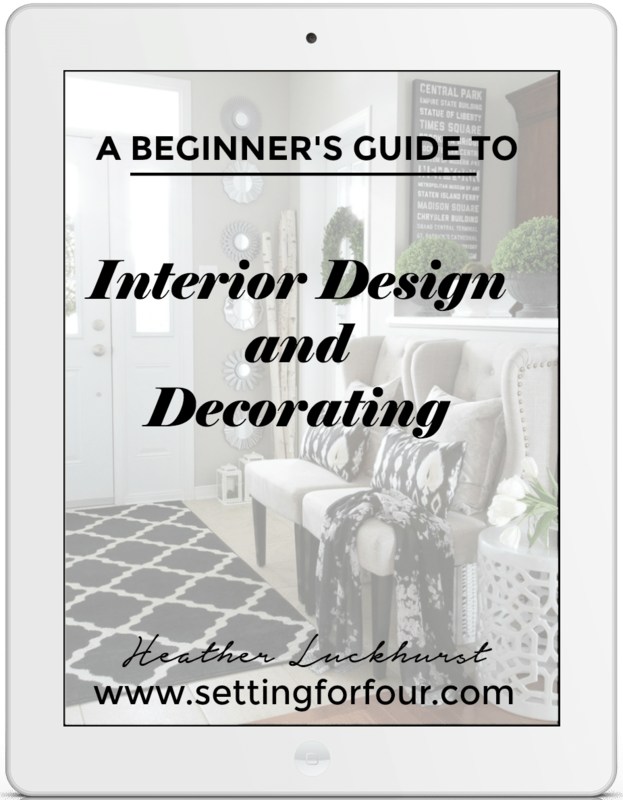 Now grab a cozy chair and a cup of coffee and head over to my friend Taryn Whiteaker to see her creative entertaining ideas! 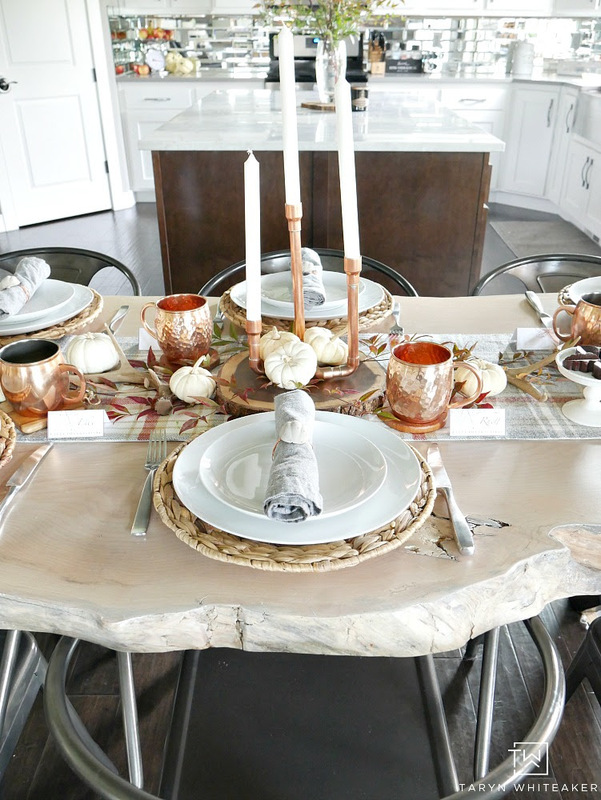 I know you will love her Thanksgiving Table with Copper Accents! You can also see the full line up linked below, in case you missed Monday and Tuesday’s tours and to see what’s upcoming for the week. Have you visited the Setting for Four Shop? 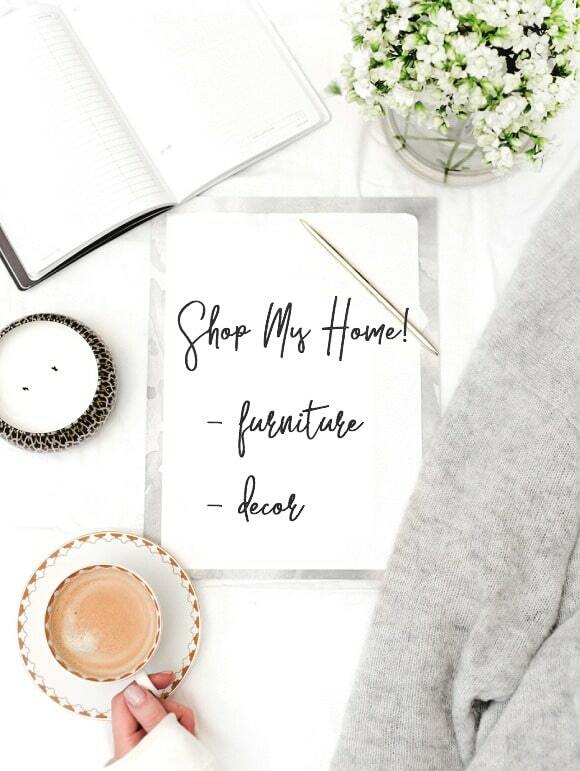 I’ve added my home furnishings and decor all in one place for you to browse and shop! Hi Heather! I have the same chargers and love them! All the blue is just beautiful. Every time I come to your blog I am blown away by how lovely everything is. Well done my friend! This is so refreshing and just elegant! 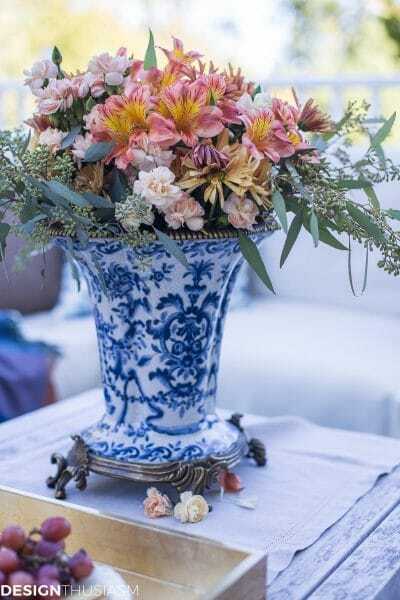 I love how the blue pops and the mixture of the floral. Heather, your table is gorgeous!! 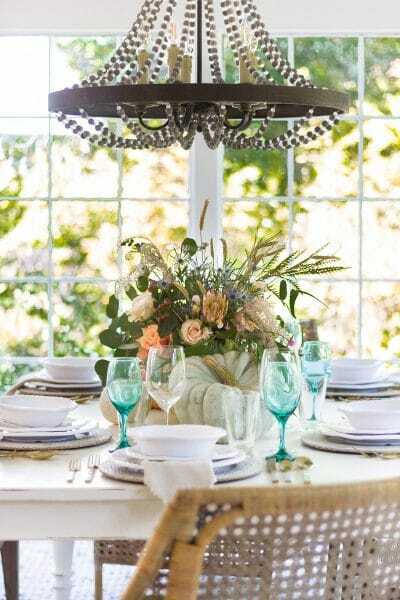 I love that centerpiece and your color story is so refreshing! Loving the new chairs too!! 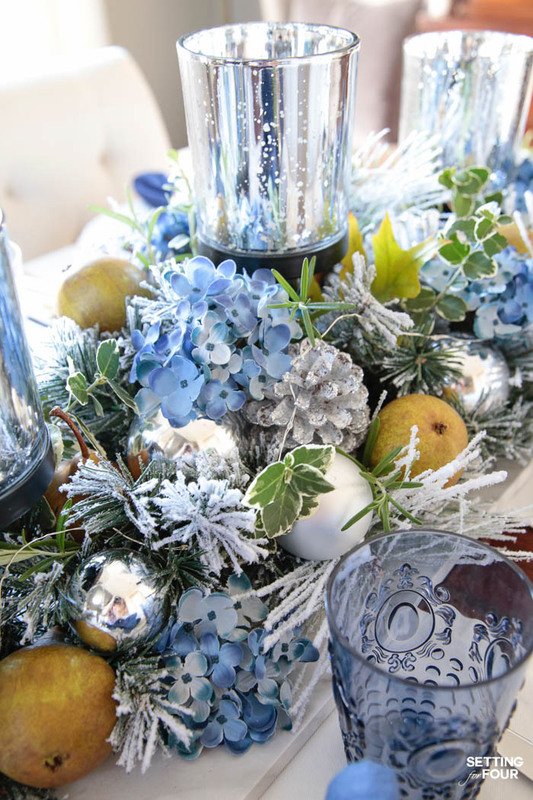 Heather this is gorgeous, I love all the blues and how you used the centerpiece with twinkle lights! 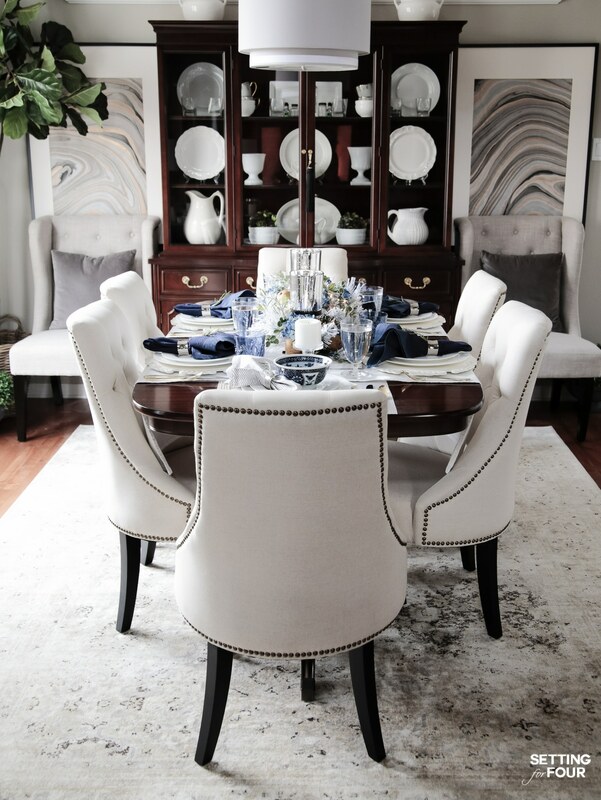 I love the soft color palette of your table setting. Its adds such simple elegance! Thank you Julie for your lovely compliments! 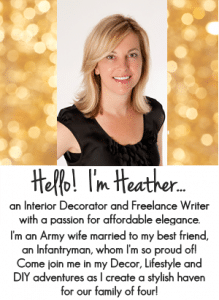 I love it all Heather! The tiny touches of Christmas are so timely and perfect. The bling and crystal would make any guest feel extra special. Gorgeous! Oh how fabulous to hear! Thank you for sharing that with me Rebecca! 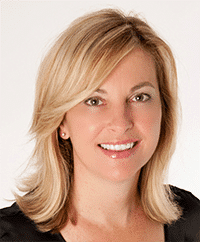 I’m so glad you like my dining room – have FUN in your dream home and congrats!!! !